Welcome to Bed and Terrace guesthouse Chiang Mai. Chiang Mais most central, very new and trendiest value guest house catering for the budget traveller. Bed and Terrace Guest House Chiang Mai is centrally located in the heart of Chiang Mai, between Night Bazaar and the old city, within a short walking distance to ancient Thapae Gate, weekend walking streets both saturday market and sunday market, the oldest temples, the best night life area - Loi Kroh road and mega electronic store - Pantip Plaza. We provide guest a wonderful budget guest house experience, our guest house is decorated in contemporary style with senses of Chiang Mai. The atmosphere feels more like a friends trendy apartment with friendly staff on reception, happy to serve you. Bed and Terrace is a small and homely place with a limited number of rooms and guests so if you want a quiet place and good accommodation with a reasonable price, stay with us. Every rooms at Bed and Terrace Chiang Mai guesthouse are corner rooms with double wide windows that can open, high ceiling and private terrace, on high floor rooms offer beautiful mountain views and wonderful city views. You will find our rooms are bigger, comfortable and stylish. Bed and Terrace provides hotel amenities for free, towel, soap, shower gel, shampoo, cotton buds, bed accessories and bathroom paper. You can check e-mail and connect to Facebook in your room via high speed Wi-Fi for free. Get local map, drinking water and self service coffee for free. Even, our maid also clean your room for free everyday. You will feel safety from our 24 security cameras with infrared. There are many tours in Chiang Mai you can't miss, trekking, white water rafting, ride the elephant, Flight of the Gibbons longest zip line, Chiang Rai trip, Doi Inthanon natural park ( highest peak of Thailand ), drive ATV car, rock climbing and many more. 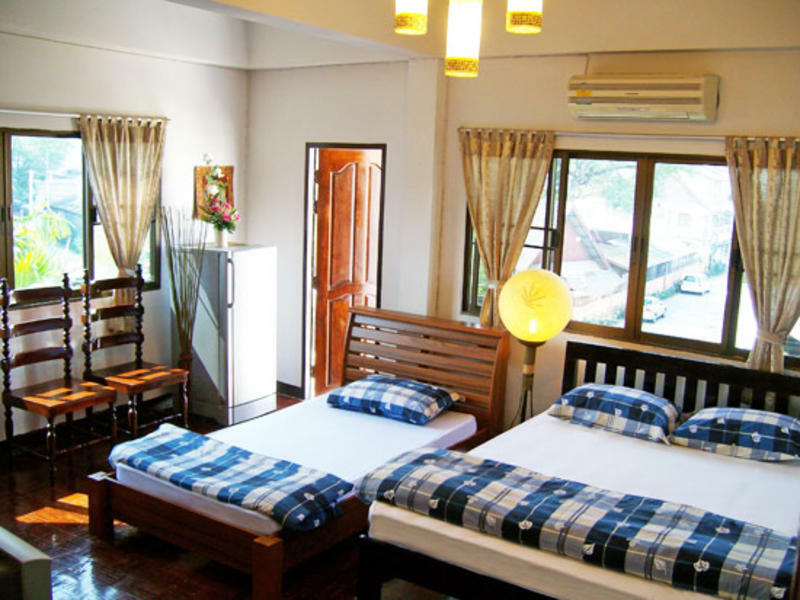 Easy to arrange Chiang Mai tours at this Chiang Mai guesthouse. To make your trip comfortable and convenient, we also have laundry service, motorcycle and car rentals, Laos trips, visa run and transport ticket arrangements. If you are looking for great rooms and great atmosphere in great location that is worth the money, then Bed and Terrace Guest House Chiang Mai is the right choice. - Basic Double is fan room, great fan room with nice decoration, stay this room if you don't like air conditioning and want to save for fun activities in Chiang Mai. very comfortable room with great facilities, mountain and city views. - Deluxe Double is air conditioning room, cozy room on high floor with stylish wooden furnitures, panoramic mountain views, LCD TV. - Superior Double is Dream SUITE room, trendy studio suite with private terrace on top floor, massive size, king size bed, living and dining area, kitchen table, 360 Degree stunning views, exciting Doi suthep mountain views, Sony Bravia 40 inch, iPod docking and hair dryer. - Ready to supports for out of office hours, for any urgent cases after office hours, guest can call to staff anytime, then we will help you resolve cases in a minutes. Check in to room : 1.00 PM - 10.30 PM or leave your bags before at reception office. Early Check-in can be requested depends on availability. restaurants, grocery stores, markets, 7-Eleven and ATM are in the area. Bed and Terrace Guest House is located on Kotchasarn Rd 5. Take the local transport services and tell them goto 'Bed and Terrace at Kotchasarn Soi 5'. Because, we're in the most central Chiang Mai so you can reach us only 9 - 10 mins from every transport station; airport, bus station or train station.